Why would an attorney prefer a bad settlement over a lawsuit? It’s because lawsuits require large amounts of time, money, and energy. The costs can be substantial, and the outcome is never guaranteed. Even if the attorney wins, there’s always a chance the losing party may appeal. Throughout the entire lawsuit, there’s no money coming in. Personal injury attorneys work on contingency, meaning they don’t get paid until they win the case. If the settlement offer is just too low however, and doesn’t even cover your medical bills, a lawsuit may make sense, especially if mediation or arbitration is not available. Worse, there may be no settlement offer at all. When all else fails, a small claims lawsuit is a strong option to fall back on. If you want to file a small claims petition, you first have to know where the court is located. The fastest way to find it is searching online or looking in the phone book (look in the Government section). Small claims courts can also be called Municipal courts, Justice of the Peace courts, and even District courts. Depending on the population in a given area, some courts have dual jurisdiction, meaning in addition to small claims cases, they hear zoning violations, traffic tickets, and minor criminal offenses. If you don’t see a listing for small claims court, call one of the other listed courts. The clerk will let you know if their court hears your type of case. If not, she’ll direct you to small claims help. When you reach the correct court, ask for the jurisdictional amount. That’s the maximum amount you can sue for in the court. There’s no sense in filing a small claims lawsuit if your damages exceed the court’s limits. If they do, you’ll have to pursue the next highest level of court. Unfortunately, the clerks in small claims court are not permitted to suggest which higher court you should go to. It would be considered giving you legal advice, which is strictly prohibited. If you do decide to pursue your case in a higher court, you’ll need an attorney to represent you. The rules and procedures in higher courts are much more involved than in small claims court, and you’ll be facing seasoned defense attorneys. It’s no place for a layman. There’s always a fee to file your case in small claims court, usually between $50 – $100. In some states, like California, you can enter your case and pay your filing fee online. In other states, like Texas, you must appear in person to fill out the court’s form and pay the fee. Several states, including New York, permit you to electronically file a small claims case through private companies, but someone from the company has to appear at the courthouse in person to file the complaint and pay the filing fee. Whether online or in person, you must complete and file an official complaint form along with the filing fee. The complaint form effectively is the lawsuit. You do not sue the insurance company. Although the company will most likely defend the lawsuit on behalf of their insured, the law requires you to serve the party who caused your injuries directly. Depending on your state’s laws, lawyers may or may not be permitted in small claims court. 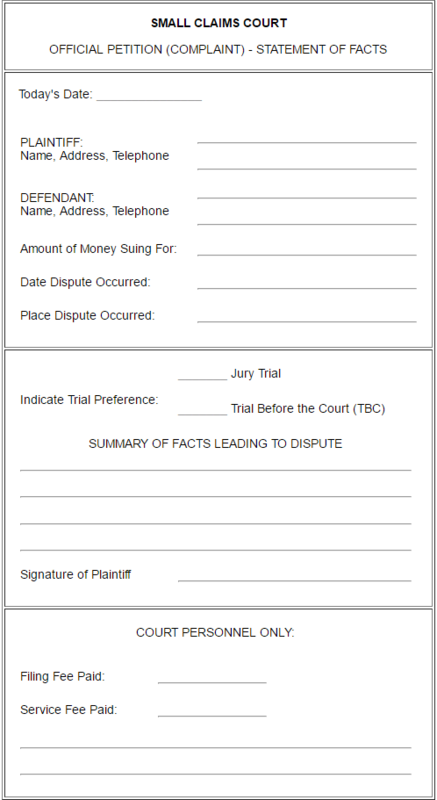 On most petition forms, there’s a box to check if you’d like to have your case heard before a jury, or before the judge alone without a jury (known as a “bench trial”). Texas and Oklahoma are among several states which permit small claims trials to be heard before a jury. If there’s no place on the form to request a jury, ask the clerk. Juries often vote with their emotions. They don’t like to see a “little guy” get taken advantage of by a big, bad insurance company. If the facts of your case are a little blurry, but you feel like a jury would react favorably to your argument, request a jury. If you feel like your facts and evidence are solid, go with a bench trial. In the summary section, state why you are suing the defendant. Don’t include many details. You don’t want to give the defendant advanced notice of your evidence, or the strategy you intend to use at trial. You’ll cover the specifics of your case in court, not in the complaint. On June 1, 2014, I was driving northbound on 39th Street in Manorville. I was stopped at a red light at the intersection of 39th Street and Mimosa Drive, when the defendant drove into the back of my car. As a result, my car was damaged and I was injured, requiring medical treatment and therapy. I also had out-of-pocket expenses for medications and related items. While in treatment and recovering, I had to miss work and wasn’t paid for the days I missed. My total damages are $3,700. The defendant refuses to pay. On June 1, 2014, I was shopping at the Jameson Hardware store. While shopping, I slipped and fell on water which had pooled on the floor. As a result, I was injured and required medical treatment. I also had out-of-pocket expenses for medications and related items. While recovering, I had to miss work and wasn’t paid for the days I missed. My total damages are $2,900. The defendant has refused to pay. Filing a small claims petition improperly can result in unnecessary delays in your trial, or your case being dismissed without your knowledge. Many small claims lawsuits are dismissed every year simply because they weren’t filed correctly. Like any other court, small claims courts are burdened with overcrowded dockets. Judges have little time or patience for those who can’t follow simple filing rules. A small claims judge has every right to instantly dismiss an improperly filed case. To avoid a delay or dismissal, carefully review all of the information you entered on the complaint form. All names must be spelled correctly and include a middle initial if one is used. Street numbers and addresses must be accurate. Most states don’t allow a post office box as an address, so be sure to use complete street addresses and apartment numbers. An incorrect name or address can result in the defendant not being served by the court’s process server, causing an unnecessary delay. When defense attorneys catch a misspelled defendant’s name, incorrect address, or wrong date of dispute, they can file a Motion to Dismiss due to the plaintiff’s failure to correctly identify the defendant. Because many states require “personal service,” you may have to pay an additional amount to have a local sheriff or constable officially serve the defendant. Some states allow private process servers to do this, but they are expensive and used mostly by attorneys who want to have defendants served quickly. You can’t serve the defendant yourself. That could create a conflict of interest and possibly a personal confrontation between you and the defendant. Although some courts permit service of process with a certified letter from the clerk, there’s never a guarantee it will actually take place. The defendant has to sign personally for the letter, and if he doesn’t, you’ve wasted your time and money. You’d then have to start over from the beginning. One positive effect of having the defendant served by a local sheriff, marshal, or constable, is the shock he’ll experience when a uniformed officer with a badge and gun comes to his home or workplace. You can be sure he’ll immediately call his insurance company, wanting to know why he was just speaking to a police officer. The distress of being served is often enough to prompt a settlement. No one likes getting sued. Insurance adjusters are notorious for failing to tell their insureds that settlement negotiations have broken down, and they should expect court documentation to be personally served on them. Within a week or so after the service of process, you’ll receive a letter in the mail from the clerk’s office, letting you know the defendant has been served. After that, presuming the insurance company doesn’t contact you to settle the case, there will be a waiting period before the trial. Depending on the population in your area and the number of cases on the court’s docket, you may have to wait one to six months before you receive a second letter setting the trial date. The defendant will receive a similar notice. During the waiting period, you should be preparing your case. Attorneys thoroughly prepare for trial. You should too. Once you’ve filed your small claims lawsuit, you should focus exclusively on organizing your evidence and preparing a solid case presentation.